BJP's Bihar president and MP Nityanand Rai earlier said “all fingers and hands raised against the prime minister” should be broken or chopped off. 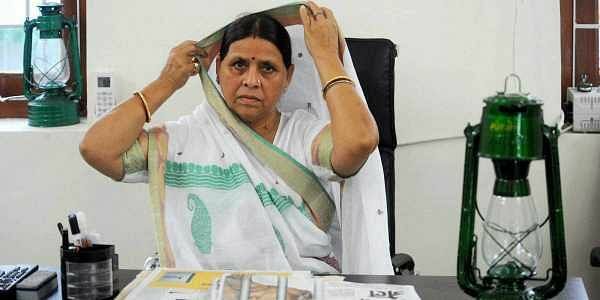 PATNA: A day after BJP's Bihar president and MP Nityanand Rai said “all fingers and hands raised against the prime minister” should be broken or chopped off, the Rashtriya Janata Dal leader Rabri Devi dared the BJP to do so. Rai, the MP from Ujiyarpur Lok Sabha constituency and a prominent Yadav leader of the BJP, apologised for the controversial comments he made, saying he was merely using a colloquial idiomatic expression in Hindi. He also said he regretted hurting people’s sentiments. But the apology did not stop Rabri Devi, a former Bihar chief minister and RJD chief Lalu Prasad Yadav’s wife, from making further intemperate statements. “The BJP leaders say they would chop off the fingers and hands raised against Narendra Modi. I ask them to do so if they have the guts. There are many who would want to cut off Narendra Modi’s hands and neck,” said Rabri Devi in her address at RJD’s national executive meeting in Patna. Rai made the controversial remarks in his address to a summit of the OBC communities of Vaishya and Kanu in Patna on Monday. He extolled the PM’s rise to the top from humble beginnings, asserting that Modi’s rise meant the rise of the poor in India before he uttered the contentious words. “This son of poor parents has risen to become the prime minister. This is why everyone in the country should rise above all considerations and show respect to him. We should together either break or, if necessary, chop off all fingers and hands raised against him (Modi). We should proceed with this confidence,” Rai had said. State Congress leader Premchandra Mishra condemned Rai’s choice of words. “Such speech is unbecoming of an MP and the state unit chief of a national party. Rai must not forget that such language is unacceptable in a democracy,” he said. “This is the real language of BJP, which comes out in the speeches of some of its leaders. This is the language of intolerance, and the people are noting it down,” said RJD spokesperson Shakti Singh Yadav.